Luke’s Toy Factory designs and manufactures Eco Friendly Toys, right here in the USA! We use innovative, safe, green and sustainable materials to make fun, safe, educational toys for children ages 3 and up. All toys are designed, manufactured and assembled in Connecticut. This is the Tipper Truck. It’s made from 30% sawdust and 70% safe, certified, clean plastic. No paint or glue. And battery free. This is a 4 piece toy that’s very entertaining! It rolls smoothly and has safe, smooth edges. The truck is quality built and unique in design. For all that this truck has to offer, we give it a 100% score! Luke’s Toy Factory has several other truck designs (the truck pieces are interchangeable). This is the kind of toy that I’d like to see in stores because it’s made in the US, it’s eco, and because it’s fun. Come on readers, check this out ! Luke’s Toy Factory provided the Tipper Truck to help facilitate the writing of an honest review. A positive review is not guaranteed, and all opinions are my own. No other compensation was received. Perfect for the garden, and also fun at the beach, the Green Toys™ Watering Can is a classic set that encourages kids to help take care of the world around them. Made in the USA from 100% recycled plastic milk jugs, the Watering Can features an easy-to-pour spout and cotton rope carrying handle, making it frustration-free for little gardeners. The set, which includes a rake and shovel, is great for spending time together outside, and kids will love helping and playing alongside the grownups to watch their garden grow. And…it’s even fun in the tub! This toy is made from recycled milk containers. SAFE being BPA, PVC and Phthalates Free. I recommend shopping Green Toys for safe, fun, and educational toys. I received a Green Toys® Watering Can to help facilitate the writing of an honest review. A positive review is not guaranteed and all opinions are my own. No other compensation was received. AquaPlay is the original water canal system from Sweden and was developed 1977. Now as ever children of all ages love playing with water. There are plenty of things for small discoverers to learn; the concept of floating and sinking, what makes a pump work, building and construction. Today AquaPlay canal systems are distributed in more than 40 countries and delight children from 3-6 years all over the world. Both parents and educators appreciate the award-winning toy system as a representative of high-value, quality and educational play with water. It is a modular system that provides endless opportunities for expansion and rebuilding. The wide range of accessories also helps to stimulate children’s imagination. The AquaPlay canal systems can be handed down from older to younger children, providing years and years of fun and laughter. The AquaPlay canal systems are produced in Burghaslach, Germany and made of non-toxic, recyclable plastic. EN:71 and ASTM. The CE-mark and the secure three-year warranty is a clear sign of quality. The video links ⇩ pretty much sums up how wonderful this educational toy is! Quality made of non-toxic plastic. No batteries. First time assembly requires rubber seal strips to go in the grooves of the red connector pieces. During play, I haven’t had any leaking from the seal strips yet. I couldn’t say how they will perform after repeated use, but the red connectors and the rubber seals can be purchased separately. Set is expandable and can be used multiple ways. AquaPlay sets are a COOL toy for a HOT summer day. I might find other uses with it indoors without water but haven’t explored that yet. AquaPlay provided a Mega LockBox to help facilitate the writing of an honest review. A positive review is not guaranteed, and all opinions are my own. No other compensation was received. I recommend this product …..because babies are often fascinated by things that aren’t toys. 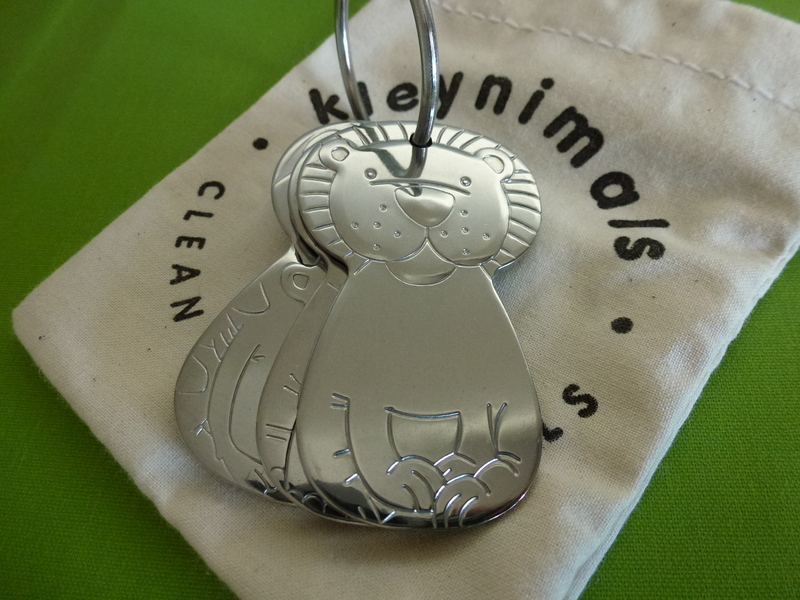 The “clean key animals” are SAFE (Stainless Steel) and FUN (animal shaped). SAFE. Made from food grade Stainless Steel. They are Non-toxic, Made in the USA, Dishwaher safe, and “Green”. FUN. There are no sharp edges and they are just as shinny and noisy as regular keys. They even have the weight of “real” keys. The set comes with 3 keys in the shape of animals – Elephant, Giraffe, and Lion. Engraving is available. Keys come in a small pouch for safe keeping in your bag or in the car. You should know why you might be paying a little bit extra for Kleynimals. Kleynimals are always “Made in the USA.” While going through the process of creating the keys, I knew that I could probably have them manufactured in China and save some money. However, it is important to me (and hopefully to you too) to have products that are made in the USA for a number of reasons. I want to ensure that quality, safe materials and fair labor practices are used in the manufacturing process. I also want to support the US economy. The two companies involved in the manufacturing process are both family-owned companies that have been around for at least a couple of generations. Kleynimals are welded and polished by a talented man (also a proud Veteran and a good friend) in Baltimore, often times with the assistance of his daughter. Lastly, Kleynimals are assembled and washed by a local non-profit organization that supports developmentally disabled adults in living self-directed lives (The Providence Center). I hope that Kleynimals make a positive impact on the babies who enjoy them and on the people who help me make them. A smart choice for baby and planet. Visit Kleynimals for more information & to purchase your set of keys. Notes From Dawn received a set of keys from Kleynimals to help facilitate the writing of an honest review. A positive review is not guaranteed, and all opinions are my own. No other compensation was received.